Earlier this year, someone dumped 9 young muscovies at the lake. There was a wide variety of colors among them. They stuck together and at least 7 of them made it. Now they are older juveniles. They are thriving on their own at the lake. This one is a pretty color knows as Swedish blue. There may be some of that breed in its ancestry. 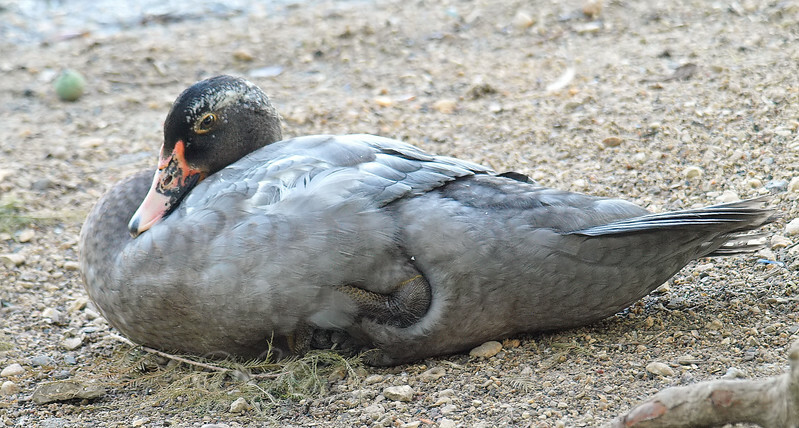 You can tell it is a Muscovy by the elongated body and the beginnings of the Muscovy warts at the base of the bill along with the color of the bill.